With technological advances impacting the world more and more, hardware is rapidly evolving. And yet, in some cases, some of the world’s best hardware remains fully functional without a whole lot of changes. That’s undeniably true of traffic control equipment. Sure, technology has improved various traffic control devices in subtle ways. But overall, they still rely on the qualities of strength and visibility to get the job done. So, it really gets down to how good is a traffic control service at selecting and implementing this all-important equipment. In the case of Roadway Construction Service, the answer is very good. Roadway Construction Service considers the selection of traffic control devices both an art and a science. Intuition and knowledge in perfect sync. Such a rare combination requires the expertise and commitment of hard-working people. We like to think that those on our team are among the most eminently qualified in the field. Let’s start with our traffic guards and traffic control flaggers. For Roadway Construction Service, it’s not just a matter of learning a few hand signals and waving a flag or two. Way too much is at stake. Roads, motorists, work crews, bicyclists, pedestrians, and even household pets must be kept safe. That’s why the top priority of our flaggers is safety – everything else flows from this commitment to protect without compromise. To ensure our traffic control flaggers perform flawlessly, we hold them to the highest standards. In our estimation, they must stand on the top tier of California traffic control. Therefore, from the start, they must prove themselves qualified for duty with the successful completion of a grueling training regiment — our version of boot camp. Those who emerge successful are qualified by the industry’s highest credentials, including the OSHA certification. That’s one part of the equation. 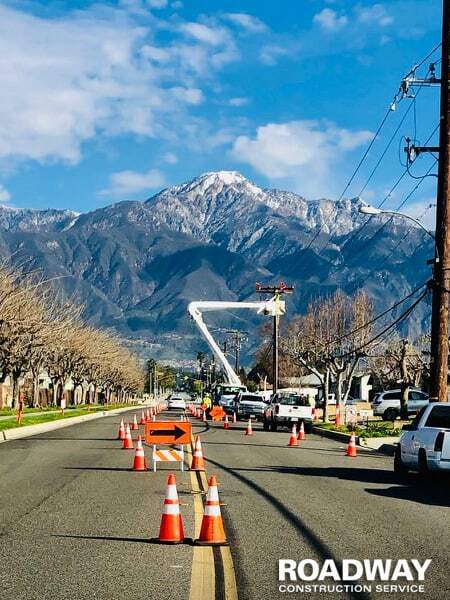 Roadway Construction Service also goes to great lengths to ensure the proper selection and implementation of traffic control equipment. Having a very extensive selection helps in this regard. But as with our flaggers, the human element also plays a vital role. After, it’s people who ultimately do the choosing. One area in which the right choice is critically important is that of lane closures. A wide range of road barricades is available for this purpose. But which? Choosing requires skill, experience, and insight. One piece of hardware likely to get the call is k-rail rental (or Jersey barrier). Because of this road barrier’s critical importance, we’ve developed a sophisticated program of k-rail rental (concrete and water-filled). Drawing a distinction between the two types of k-rail is extremely important. Each has its own purpose. Concrete generally is used for long-term projects, while the more portable plastic water-filled variety is ideal for temporary assignment. For a wide range of road traffic control projects, we must determine which version of Jersey wall gets the call. The selection of road barricades is important for every type of traffic control service. 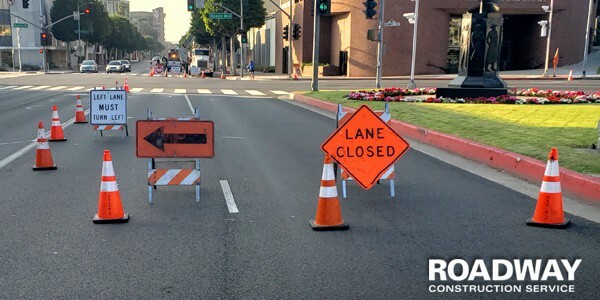 Whether we’re providing work zone traffic control or comparable services for public events such as holiday parades, the right traffic control equipment is crucial. At Roadway Construction Service, we consistently choose the right hardware. And we support our choices with exceptionally-skilled, highly-trained flaggers. It’s an unbeatable combination that has served our clients well for many years.